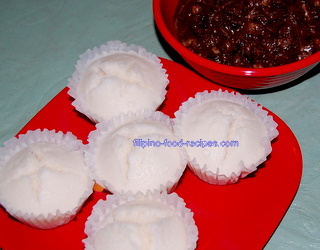 Puto, the Filipino rice cake is made from cooked rice that has been soaked and ground up to make the rice dough or galapong. Then coconut milk, sugar and leavening is added before steaming. It is pretty much the same as the Chinese's Steamed Rice Cake. Making galapong from scratch is quite tedious, so a lot of recipes (including this one below) came up using rice flour, Bisquick, or even any ready-made Waffle mix. Though the texture is not as sticky as that when using galapong, the taste still does come close. Common leavening agents used are baking powder and active dry yeast. 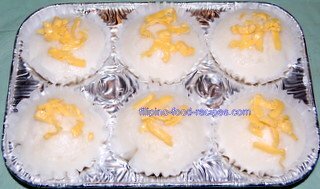 Double-Acting Baking powder gives it either a flower-like or a rounded top, so cooking in individual containers is advisable. On the other hand, active-dry yeast leaves the top flat, so it's best to cook in a square pan and then sliced to serving sizes. PREPARATION TIME : 10 minutes plus 1 1/2 hour for letting the mix rise. 1 Mix together the coconut milk and rice flour. Add the sugar and softened butter. 2 Heat up the water and add to the rice flour mixture. Strain and let it cool down thoroughly. 3 Add the baking powder and vanilla essence and set aside for an hour and a half. 4 Pour the mix on a lined muffin pan up to 2/3 full. 5 Steam for 25 - 30 minutes or until the top is firm and a toothpick inserted in the center comes out clean. 6 Let it cool down before taking out of the pan. Please make sure to use double-acting baking powder, Rumford or Argo brands are my preferred brands so the rice cake will rise properly. Do not add the baking powder until the mix has totally cooled down, otherwise, it will not rise properly. Use food coloring to make it colorful and attractive, just don't overdo it. Pastel and subtle colors will look more appetizing than bright colors. Omit the vanilla essence if you want an authentic, coconut milk-flavored puto. Top it with cheese, as below.